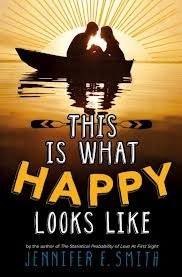 Aww, what a lovely story This Is What Happy Looks Like by Jennifer E. Smith is! I went through an entire range of emotions reading this book - from ridiculously happy at the beginning to pain and heartbreak. I was laughing as well as crying reading this book and was an absolute emotional wreck once I'd finished and I really loved that about this book. Right from those very first pages as we read through the email banter between our two main characters, Graham and Ellie, and we learn that Graham has a pig called Wilbur inspired by Charlotte's Web, I knew that I would absolutely fall in love with this story. Or at least with Graham, because how sweet is that? But it certainly doesn't stop there. Ellie and Graham continue to email each other anonymously, You've Got Mail style for months, slowly forming this emotional connection with each other. So much so that Graham decides to pitch Ellie's hometown in Maine as the new location for the film he's starring in so that the two can finally meet. I kind of love that this book is more than just the love story though. There's also the isolation that Graham feels as a film actor, living away from his parents on film sets and far removed from his mostly normal childhood that he misses. And Ellie is burdened with this family secret of who her father really is and starting up a relationship with a heartthrob film actor will definitely out that secret. This Is What Happy Looks Like was a really wonderful story, one that I fell into easily. I loved the inclusion of the film set and paparazzi but also the small-town coastal setting. I love that these two people met over the Internet and have trouble separating their online selves from the true selves and have that added complication of one of them being a Hollywood actor. Everything about this book just made me happy to read it, even when my heart was hurting when everything doesn't quite work out. This is a story that really inspired me. I read this book and I wanted to grab my whoopie pie cookbook (yes, I have one of those!) and whip up a dozen whoopie pies immediately. I wanted to look up my favourite poetry and frame beautiful poems and put them up around my house. And most importantly, I wanted to create my ultimate list of what my happy would look like. And on that list would definitely be reading such a sweet, romantic and emotion-filled story like This Is What Happy Looks Like. I really recommend that you read this one! Rats- I've been avoiding looking at this one because I have wayyy too many books to read already... you've made me want it now! Oh you should read it Sally, it is a lovely book! Very sweet and happy-making! Oh Cliona, I really, REALLY did :) I hope you do too! This is such a lovely review! I'm going to be reading this one this month so I'm really happy it lived up to your expectations! Oh, I do love it when a book makes an emotional wreck! Looking forward to this one. I just finished reading this. *sighs* I agree about the first few pages, it's so lovely! Just the whole idea of an email exchange is fab! You have a whoopie pie cookbook? NO WAY. I am definitely going to have to come over to yours one day and try your whoopie pies :D The poetry, YES. I DO have a whoopie pie cookbook. It was given to me last year, I believe, from Random House at a blogger brunch. I keep meaning to make some whoopie pies with my boys and blog about it. I really should do.